When I wrote about Bitcoin in December (The Bitcoin bubble), I likened it to intrinsically worthless pre-1949 Chinese bonds and Weimar Reichsbanknote marks. Bitcoin was then trading at around $US10,000. Within a fortnight, the price had doubled. Since then it has fallen, but is still trading at more than $6000. As well, there are now nearly 1700 other cryptocurrencies in existence. The Bank for International Settlements – the central bankers’ club in Basel – has devoted a full chapter of its recently published Annual Economic Report 2018 to the cryptocurrency phenomenon. It spells out why Bitcoin, despite its persistence, has no future as a currency. The BIS goes a little further. Until now, the mainstream opinion was that Bitcoin had failed as a currency substitute, but the blockchain technology seemed to have a multitude of potential applications. Blockchain is a decentralised digital ledger in which users keep the records up-to-date, instead of this being done by a single central coordinator. BIS is sceptical about the widespread use of blockchain in finance. To displace, or even rival, conventional currencies, Bitcoin has to perform the functions of a currency better than existing monies. It would have to provide a widely accepted transaction medium, a stable unit of account, and a reliable store-of-value. It performs none of these functions. The cost of transactions is high. 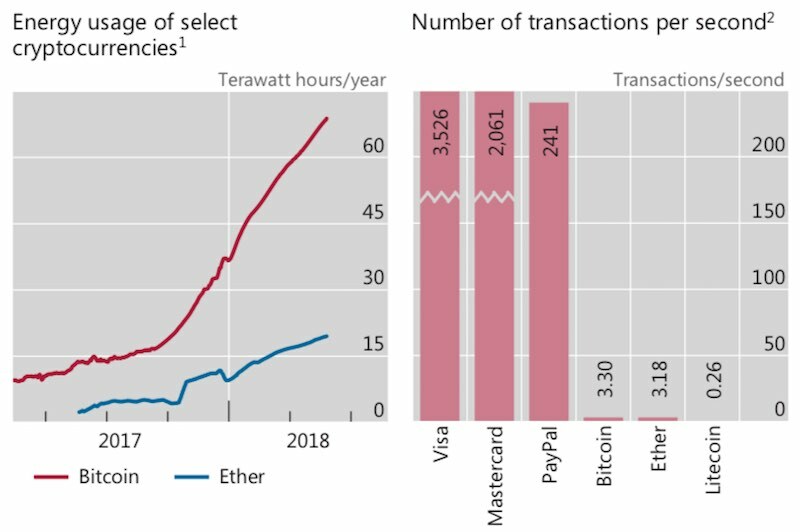 To put this in perspective, the electricity used by the specialised “mining” computers which carry out the transactions is equal to Switzerland’s entire electricity consumption. The BIS describes this as an “environmental disaster”. Delays in handling transactions and spikes in transaction fees are also common, even though Bitcoin is handling only a tiny fraction of the traffic of conventional payments systems (see a graphical comparison with other payments systems, below). The exchanges have been subject to numerous cases of fraud. 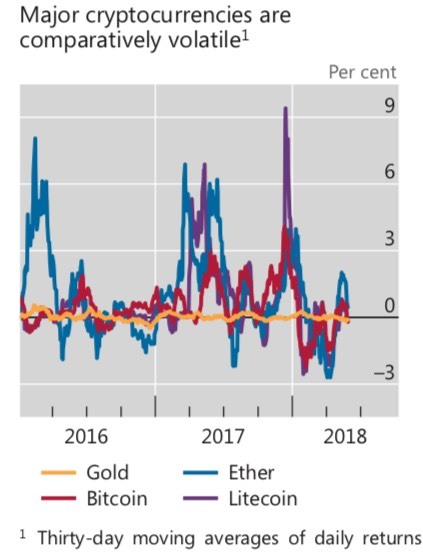 Bitcoin’s price is far more volatile than gold, the traditional commodity store-of-value (see graph below). It is not even clear that Bitcoin provides a secure opportunity for illicit transfers (drugs, tax evasion) beyond government surveillance. As Bitcoin has not been able to establish itself as a transaction medium, at some stage its holders have to re-enter the conventional payments system to make regular purchases, leaving them open to surveillance. BIS argues that the blockchain doesn’t solve the basic problem of trust. Its applications (for example, for the Australian Stock Exchange share registry) rely on a limited number of trusted parties to implement ledger transactions. If central banks introduced their own cryptocurrencies, vulnerabilities are such that transactions could only be made by a limited group of trusted parties. The sceptic’s best argument against Bitcoin is that the existing system of payments works pretty well. Paypal established a niche because small electronic transactions between individuals were not well served by the bank-based system then in use. But now, with contactless payments and smartphone transfers, the bank-based system meets these needs. Even in countries where banks have not provided adequate payments services, the smartphone network can offer cheap and secure transfer technology based on conventional currency. Bitcoin can’t compete with this. This is not to argue that the existing payments system is perfect. Currency conversions at the retail level are exorbitantly expensive, as are merchant charges when credit cards are used for retail transactions. In a payments system, the more users participate, the better it works. These “network externalities” encourage payments systems to become near-monopolies, where the capital cost of providing the infrastructure is so large that there is no strong competition from new entrants, which might discipline prices. But Bitcoin is not the answer – its transaction costs are high because the blockchain technology is intrinsically inefficient. With the current payments system, where the marginal cost of a transaction is close to zero, there is at least the possibility that ongoing pressure from the regulators and from market competition (such as Paypal) will push down excessive payments-system charges over time.